015. RRS DISCOVERY. Issued by John Player & Sons under the Tom Thumb Brand. (1992). It is card number 15 from a set of 30 entitled "Britain's Maritime History". Size: 2.9" x 2.25". Recto: View of the Discovery in Antarctic waters. Signed lower right 'Hardy'. Verso in blue and black ink: Tom Thumb | Britain's | Maritime | History | Series of 30 | Discovery | No. 15 | The Royal Research Ship, Discovery, launched at Dundee in 1901, was 172 ft long with a displacement of 1,620 tons. 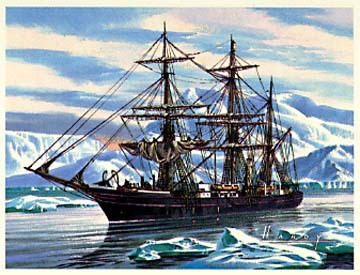 During the National Antarctic Expedition of 1901, where she served as the floating headquarters underthe captaincy of R. F. Scott RN, Discovery was frozen in the ice for two years. She carried a crew of 38 with 5 scientists. In 1904 she was sold to the Hudson's Bay Company of Canada and used as a trans-Atlantic storeship. In 1923 she was purchased and refitted by the Discovery Committee for research into whales. 1929 to 1931 she returned to the Antarctic for the British, Australian and New Zealand Research Expedition under Sir Douglas Mawson. In 1936 she be ame a training ship for Sea Scouts on the Thames, and in 1954 became the training ship for the Royal Navy HQ. In 1979 she was handed over to the Maritime Trust for restoration as a museum ship. | FREE ALBUM AVAILABLE | You can save your cards in a special 'Britain's Maritime History album. To obtain your free album, send your name and address, and post code to 'Britain's Maritime History' Album Offer, P.O. Box 99, John Player & Sons, Nottingham NG7 5PY | Issued by John Player & Sons, Imperial Tobacco Ltd. | This offer is only open to smokers aged 18 or over resident in U.K. Offer closes 30.6.92.